The delicate flower of young zucchini is something I look forward to each summer. They are a real delicacy in most countries however, they grow in abundance in their native Central America. When I was in Oaxaca, Mexico, I'd see mountains of the flowers being sold in the local markets. Not so in Vancouver. So when I did finally see the prized blossom I bought as many as I could. I bought both male and female blossoms. Female blossoms grow directly out of the zucchini fruit whereas the male flowers grow directly on the stems of the plant. 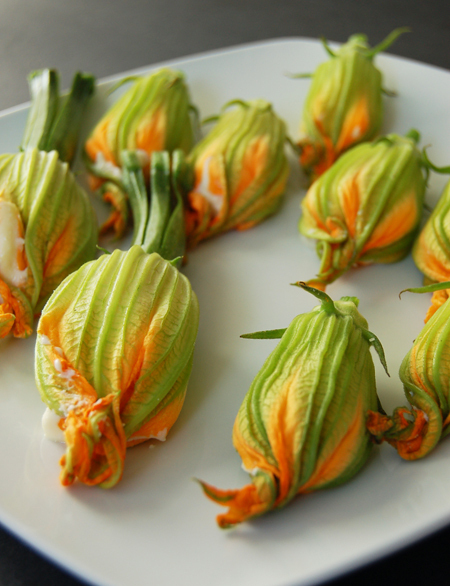 Using the word 'stuffed' with 'zucchini blossoms' just seems wrong on all levels however I cannot find a better word and judging by all the other recipes out there, neither can anyone else. I looked up 'stuff' in a thesaurus and some of the synonyms included 'overload', 'force', 'ram' and 'jam'. All wrong. I was hoping to find a word that would better describe the way you have to tenderly fill the blossoms with the ingredients. I guess sometimes literality trumps sounding pretty and delicate because the blossoms are literally stuffed with a creamy mixture of ricotta, garlic, fresh basil, egg and a little salt. They are then dipped in a light batter of flour and soda water and then deep fried for a few minutes. While it almost seems a sin to deep fry such a delicate thing the result is worth it because they remain just as delicate to eat. The batter coats the flowers ever so lightly but still has a satisfying crunch when you bite into its warm, creamy centre. 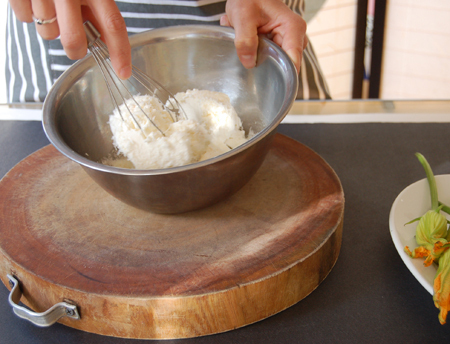 Step 1: Mix together the ricotta, freshly grated Parmigiano-Reggiano, chopped basil, egg and sea salt. Step 2: Keep mixing until the cheese forms a smooth consistency. Place the mixture into a piping bag. If you don't have one, use a freezer bag and then cut a corner off and use it as a make-shift piper. Do this just before you stuff the flowers. Step 3: Slice the stems off the male flowers. If you need to clean the flowers, gently wipe them with a damp paper towel. 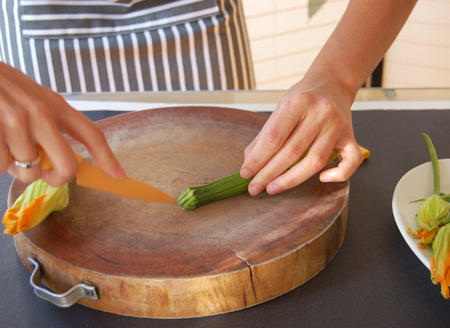 Step 4: Slice the baby zucchinis into strips ensuring the head is still attached to the flower. 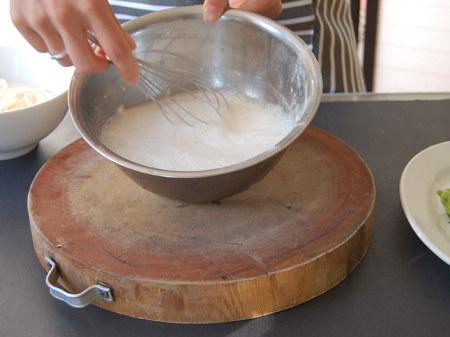 Step 5: Now whisk together the soda water and flour. The mixture will seem quite frothy, this is normal: it just needs to relax. Set aside. 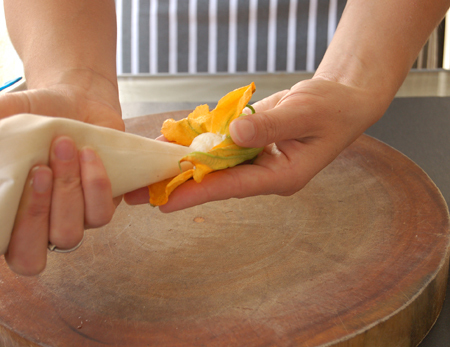 Step 6: Gently open the petals. It may take a few tries as they can be entwined. Step 7: Remove the pistil by snipping it off with some scissors. Step 8: Gently pipe about 2 tbs of filling into the flowers. They will swell up as you fill them. Step 9: Twist the top of the petals together to close the flowers. Step 10: Set the flowers aside. Heat the oil in a medium saucepan. 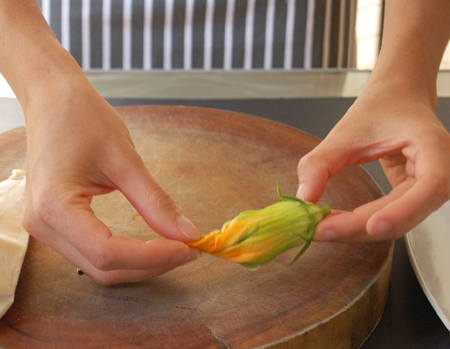 Turn on the oven to a very low heat to keep the cooked zucchini blossoms warm. 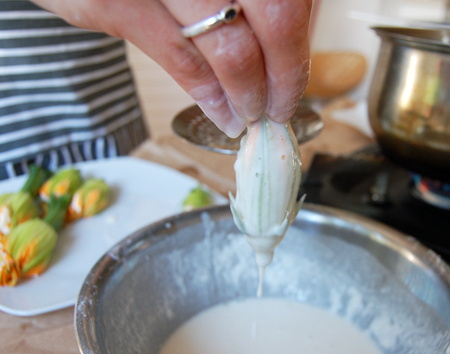 Step 11: Dip each flower one by one into the batter. 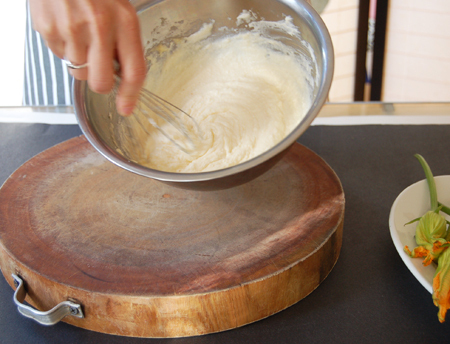 Hold it over the bowl to let the excess batter drip off. Step 12: Test the oil to see if its ready by dropping a little batter in. It's ready if the batter sizzles to the top. 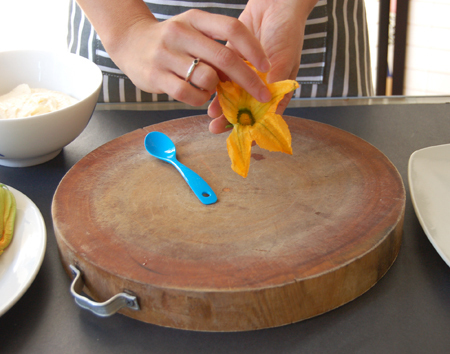 Place the coated flower on a slotted spoon and gently lower it into the hot oil. Cook the flowers until they are lightly crispy for about 2-3 minutes. Step 13: Remove flowers from oil with slotted spoon and place on a baking sheet in the oven while you cook the remaining flowers. Once all the flowers have been cooked, serve immediately. I must say I am beyond jealous with all these blossoms...I can't find them locally! Yours are beautiful...thanks for sharing them! Thank you for that step-by-step tutorial. Knowing myself, if ever I get to try this, I would just try to RAM the filling into the flower. Your zucchini flowers with stuffing are just gorgeous. 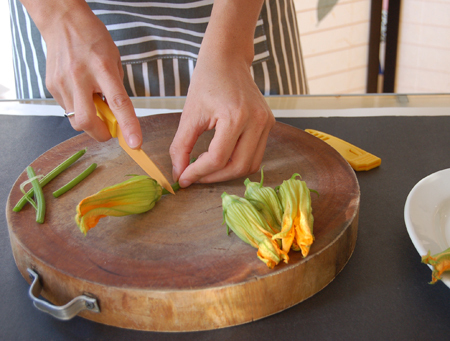 I have always wanted to make zucchini flowers - or courgette flowers as I know them. I love the idea of using up every bit of the plant. The only reason I don't make them is I am scared of large amounts of hot oil! I love the step-by-step pictures of how to do this! Those look absolutely too pretty to eat, but I'm intrigued and will have to keep my eye out for them! Wow, those look terrific! I love the ricotta stuffing. I've got about 6 flowers that I could pick tomorrow and make a half batch. Your step by step photos are not only helpful, they are amazing! Those look good! Unfortunately I have not been able to find any zucchini blossoms. Wow, wonderful step by step pictures. 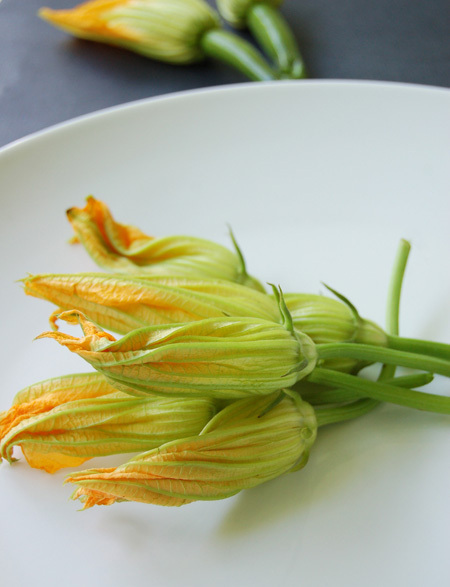 I love Zucchini blossoms... remind me of the south of France. Thanks so much for the post! I am definitely going to make these! These look fantastic, and I am going to try your version. Thanks for the pictures and the recipe. I just had zucchini blossoms stuffed with baba ghanoush and fried using a besan-based batter. They were served with a spicy tomato sauce - just a dribble. Fantastic! So many recipes, so little... no, wait, I am going to make time! 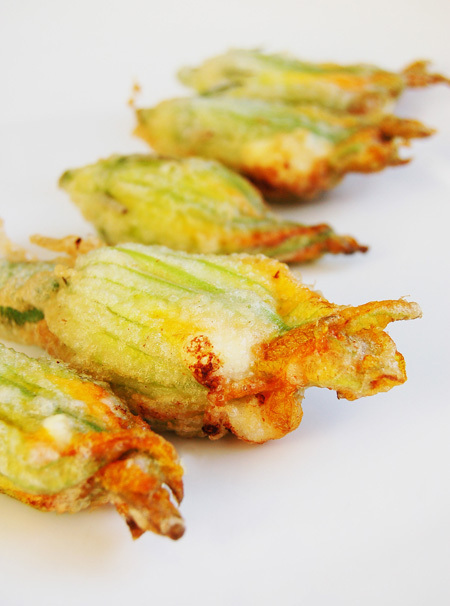 I had stuffed zucchini flowers once at a an amazing restaurant. They drizzled a little honey on them, and that savory/sweet marries so well. Just thought I would share. These look stunning. I didn't realise you could eat both the male and female flowers. I'll get straight into the garden with a pair of scissors now! Wow. These look amazing. They always have such a great texture. Did you find that the flowers themselves tasted of much? We had something very similar at Roussillon in London recently, where the chef, Alexis, put on a special floral menu for us. Great stuff and beautiful photos. these are so beautiful! ricotta and garlic...yum. I've seen these a few times before (River Cottage first, I think) but never tried them. One of the list, methinks! Beautiful pictures of one of my favorite foods! Great job, Syrie! Wow, I definitely did a double-take on that one! 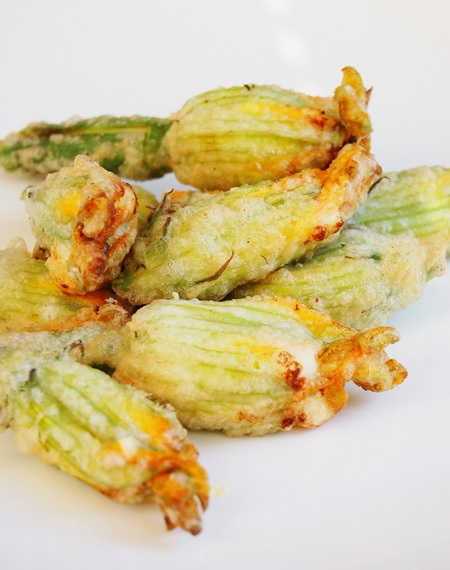 I've never heard of stuffing zucchini flowers, but I think I may have to try it! This is an excellent recipe. I followed it exactly..and loved the flavor and simplicity..especially the tempura..it doesn't get any easier than that, and it turned out perfect. I'm thinking of trying cream cheese next time just for fun. I made these tonight with blossoms from my garden. They turned out so nicely, thanks to your detailed instructions and photos. Raves all around from my guests. Well done! Cxx. Extremeley terrific directions. So desciptive and easy. I wish every recipe was this well written. I TRIED IT AT HOME ITS VERY TASTY..
Hmmm... Looks interesting! I never knew that before. Wish I can also have a taste of it in myself. Anyway, I've been looking for topics as interesting as this. Looking forward to your next post. Cover tightly and cook over moderately high heat until just tender when pierced with a knife, about 10 minutes. 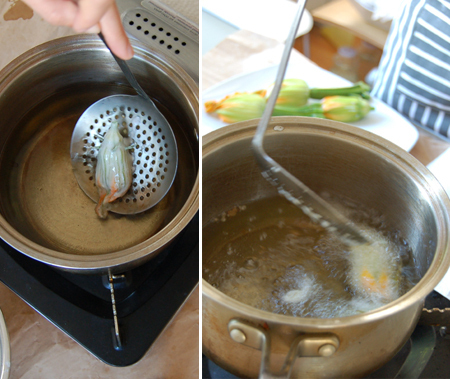 Uncover and cook until the liquid is reduced to 3 tablespoons, about 2 minutes longer. 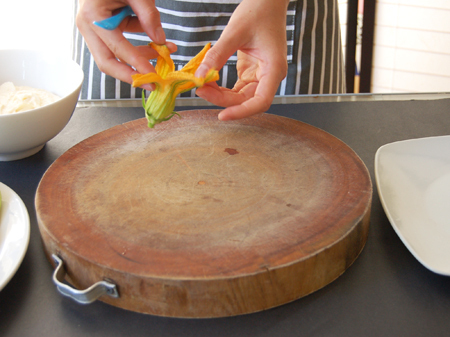 Transfer the zucchini blossoms to a platter and drizzle the pan juices on top. This Recipe of Zucchini Blossom is very easy to cook and We can also serve to our host's.But I don't no Its Zucchini Blossom is testy or no.Any ways.I will try. Just wondering, if i can use this information for my research paper's project. However, i admire the way you present your words ... Thank u anywys..
My God! I am hungry! Too delicious! I never knew that before. Wish I can also have a taste of it in myself. Thank you for such a wonderfully laid out instruction and visual presentation of this treat! My father-in-law has both squash & zucchini in his garden & now I have the tools to make this delish looking dish! These are SOOOOOOOOOOOOO good! Exquisite! I agree that this tutorial made it really easy . . .for my daughter to make them. I supplied the grilled tilapia, zucchini and portobellas, but the blossoms were the main attraction. These are really what I was looking for your pictures are wonderful, I was thinking of putting in the squash flower mozzarello and prociutto ham. Thank you for sharing this for me. My question is: why did you use Soda?